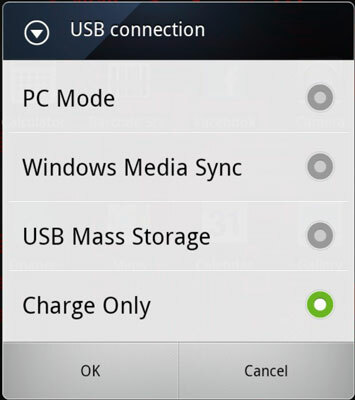 Upon successful connection of your Droid Bionic to a computer, you have the option of configuring the USB connection. You have several choices, as shown in this figure. PC Mode: Don’t use this option. Windows Media Sync: This option is used on a Windows PC to treat the phone as a media device, similar to a camera or an MP3 music player. It’s ideal for synchronizing files. USB Mass Storage: When this option is chosen, the computer treats the phone like a removable storage device, such as a USB thumb drive or a media card. Charge Only: Use this option when you only want to charge the phone and not have it communicate with the computer. When in doubt, choose the Charge Only option. On a Macintosh, use either the Charge Only or USB Mass Storage option for connecting the phone. The Mac may not recognize the Droid Bionic PC Mode or Windows Media Sync settings. After choosing the Windows Media Sync or USB Mass Storage options, you see one or two AutoPlay dialog boxes on your Windows PC. You can choose how to deal with the phone by using this dialog box to choose an item such as Open Folder to View Files or Windows Media Player. Or, just close the dialog box. The reason you may see two AutoPlay dialog boxes is that the Droid Bionic features two storage locations: internal storage and the MicroSD card. One AutoPlay dialog box appears for each storage location. When you’re done accessing information on the Droid Bionic, you should properly unmount the phone from your computer system. You cannot access the phone’s storage while the Droid Bionic is mounted into a computer storage system. Items such as your music and photos are unavailable until you disconnect the phone from the computer or choose the Charge Only setting for the USB connection. No matter which USB connection option you’ve chosen, the phone’s battery charges when it’s connected to a computer’s USB port — as long as the computer is turned on, of course.